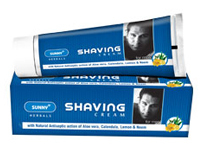 Bakson's Sunny Herbals Shaving Cream for a close & smooth shave. Relieves dry skin, soothes redness and irritation. Dermatologically Tested. A cream with rich lather for a close and smooth shave. Relieves dry skin, soothes redness and irritation. Dermatologically Tested. Moisturizing properties of Aloevera keep skin soft and supple. Calendula's natural restorative property infuses skin with a youthful glow. Neem relieves dry skin, soothes redness and irritation. Lemon acts as an astringent and tones skin.